The "Porcupine" is a Klamath Indian game obtained by Mr. John L. Cox, at Hampton, Virginia, from Emma Jackson, of Oregon. Second: The same as the Second movement of "Casting the Fish-Spear." 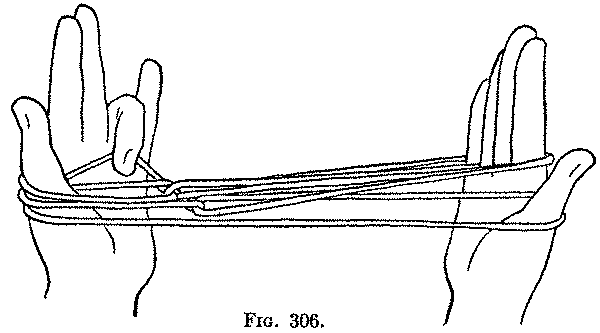 With the right thumb and index pull in turn the left near thumb string and the left far little finger to the right, in order to bring central crossings of the strings near the left hand (Fig. 303). Third: Transfer the left index loop to the left thumb, by putting the thumb from below into the index loop, withdrawing the index, and returning the thumb to its position. Fourth: Transfer the left little finger loop to the left thumb, by bending the thumb away from you over the far thumb strings and taking up from below on the back of the thumb the near little finger string; then withdrawing the little finger, return the left thumb to its position. 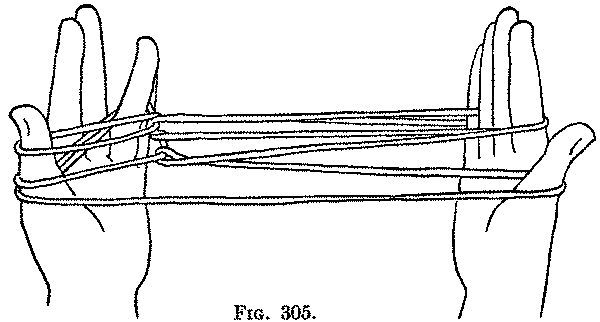 Keep the three loops on the right thumb well separated (Fig. 304). 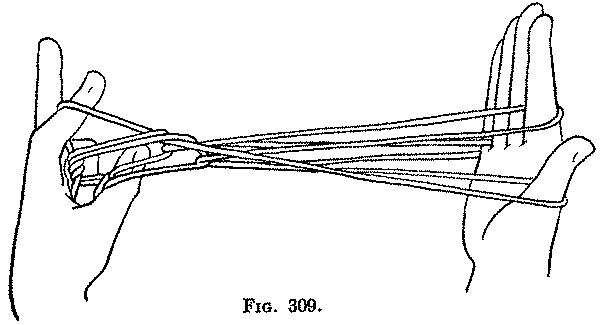 Fifth: Put the left ring finger from below through the two lower loops on the left thumb, and, pushing the two lower far strings away from you with the back of the finger (Fig. 305), bend the ring finger toward you over the upper far thumb string (the far string which passes directly from the left thumb to the right little finger) and draw it down and hold it by closing the ring finger over it on the palm (Fig. 306). Sixth: Turn the left hand so that the thumb, index and middle fingers point away from you; then bending the left index and middle fingers, pass the middle finger toward you through all the left thumb loops and pass the left index toward you into the two upper left thumb loops and then between the two upper near thumb strings and the lower near thumb string (the near string which passes directly from thumb to thumb) (Fig. 307). Now, holding this lower near thumb string between the index and middle finger, draw these fingers away from you, and by turning the index down and then away from you take the string up on the tip of that finger. 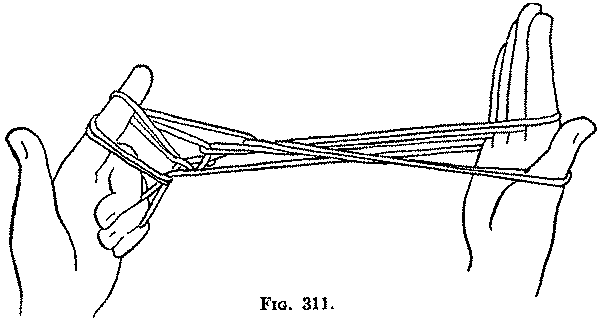 Release the left thumb (Fig. 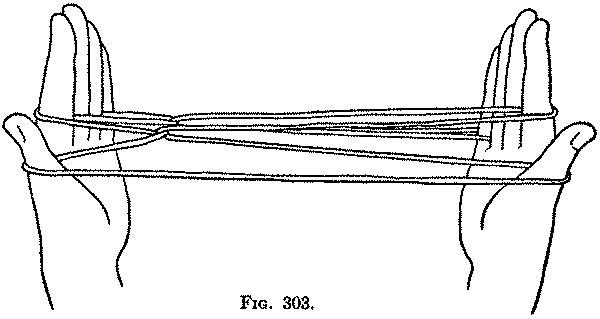 308). 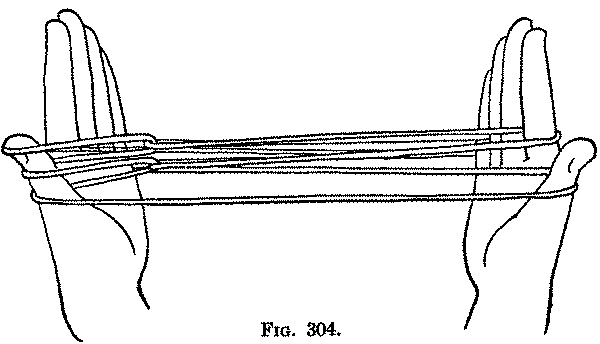 Seventh: Put the left thumb under the two right lower strings of the lozenge now formed near the left hand (Fig. 309) and pick them up on the back of the thumb. 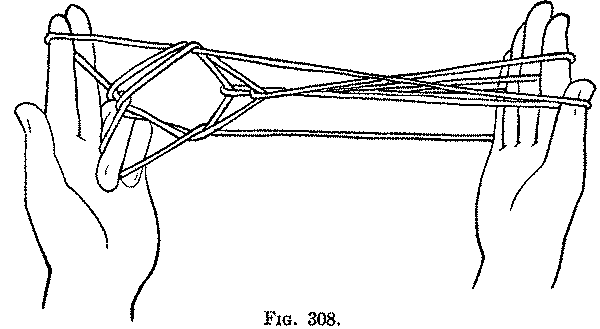 Return the thumb to its position (Fig. 310). 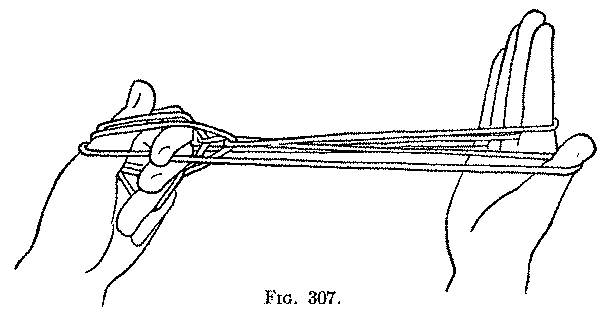 Eighth: Put the left index finger with its loop from above through the left thumb loops, withdraw the thumb and straighten the finger (Fig. 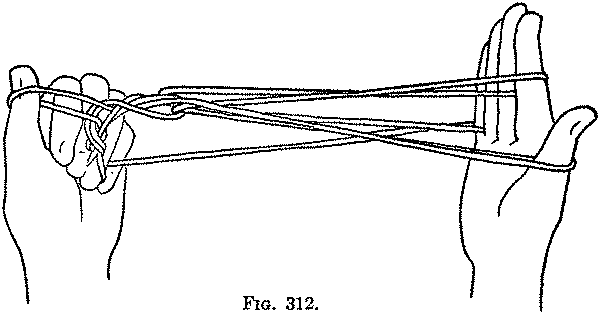 311); transfer the original left index loop to the thumb by picking up from below the near index string and withdrawing the index from all its loops (Fig. 312). Transfer the left thumb loop to the index, by pulling the index into it from below and withdrawing the thumb. 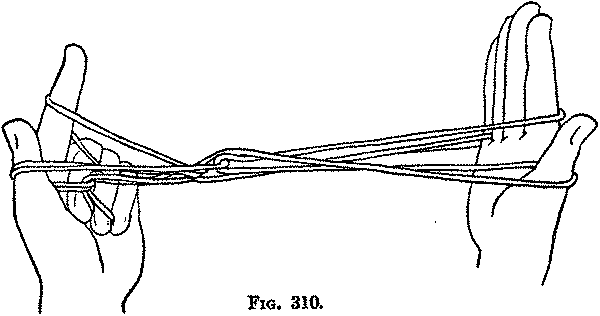 Ninth: Release the loops from the right thumb and little finger and draw the hands apart and the porcupine is formed near the left hand (Fig. 313). This is a very easy figure because the Third, Fourth, Fifth and Sixth movements are the same as tne Second, Third, Fourth and Fifth movements of the "Two Stars," but carried out on the left hand only. The Seventh and Eighth movements are new ones. The "Porcupine" appears to be really an Eskimo figure, and one very widely distributed; it is found in Alaska under the name of "Wolf" or "Wolverine" (p. 361), and, as a "Fox," is one of the six patterns from Smith Sound given by A. L. Kroeber in the Bulletin of the American Museum of Natural History, XII, 1899, p. 298.